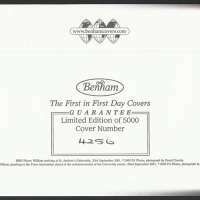 Limited Edition No 4,256 of 5,000. “E” stamps was sold for 38p on the day of issue. The “E” stamp is for letters to Europe weighing up to 20g (the first weight step). 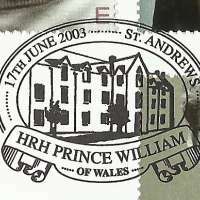 Royal Mail discontinued the use of the “E” indicator in 2004. According to Royal Mail, customers thought the stamps had something to do with the euro, the European currency that has not been adopted in the United Kingdom. Background colours were printed with iriodin ink, giving the stamp a three-dimensional appearance. to study for an art history degree. 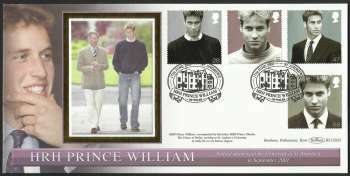 HRH Prince William arriving at St. Andrew's University, 23rd September 2001. © 2003 PA Photos, photgraph by David Cheskin. HRH Prince William speaking to the Press Association ahead of the commencement of his University course, 22nd September 2001. © 2003 PA Photos, photgraph by Toby Melville. Prince William, second in line to the throne, was born shortly after 9.00pm on 21st June 1982 at St Mary's Hospital, Paddington. 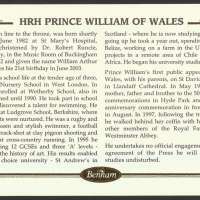 He was christened by Dr. Robert Runcie, Archbishop of Canterbury, in the Music Room of Buckingham Palace on 4th August 1982 and given the name William Arthur Philip Louis. He celebrates his 21st birthday in June 2003. Prince William started his school life at the tender afe of three, attending Mrs Mynor's Nursery School in West London. In January 1987 he was enrolled at Wetherby School, also in London, where he remained until 1990. He took part in school concerts and plays and discovered a talent for swimming. He spent the next five years at Ludgrove School, Berkshire, where his natural sporting talents were nurtured. He was a rugby and hockey team captain, a keen and stylish swimmer, a football and basketball player, a crack-shot at clay pigeon shooting and represented the school at cross-country running. In 1995 he joined Eton College, sitting 12 GCSEs and three 'A' levels - geography, biology and the history of art. His results enabled him to attend his first choice university - St Andrew's in Scotland - where he is now studying the history of art. Before going up he took a year out, spending time in manoeuvres in Belize, working on a farm in the UK, helping in community projects in a remote area of Chile and visiting countries in Africa. He began his university studies in September 2001. Prince William's first public appearance was on a visit to Wales, with his parents, on St David's Day, 1991, at a service in Llandaff Cathedral. In May 1995, he accompanied his mother, father and brother to the 50th anniversary of VE Day commemorations in Hyde Park and, later, the VJ Day 50th anniversary commemorations in front of Buckingham Palace in August. In 1997, following the tragic death of his mother, we walked behind her coffin with his father and brother and other members of the Royal Family, to her funeral at Westminster Abbey. He undertakes no official engagements on his own. With the agreement of the Press he will continue his university studies undisturbed.